Copyright © 2008, Mike Long and Oregon Kayaking. No part of this page may be reproduced, linked, or copied without the express written permission of Mike Long and the Oregon Kayaking webmaster. Jon Fowlkes and I aren’t fans of big water rivers. It’s not that we don’t like paddling on big water, we just don’t have much experience. Most of our paddling careers have been spent pinballing down low volume creeks in the Pacific Northwest. 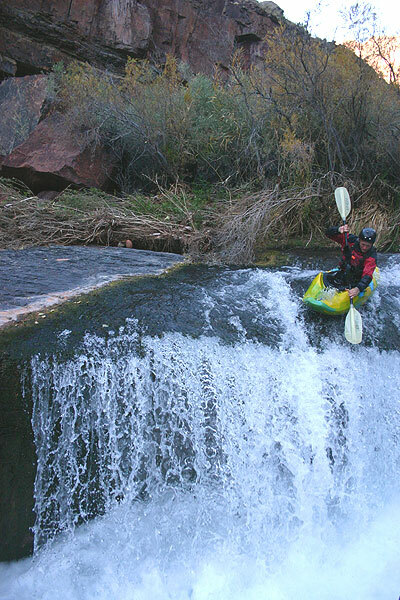 So in December of 2005 when we found ourselves in the middle of a Grand Canyon of the Colorado trip, we were itching to do some creeking. Through a miracle of connections Ryan Windsor, Jon Fowlkes, and myself were invited on a 21-day November-December Grand Canyon trip. Ryan ( a two-time veteran of the Grand ) assured us that it would be a good trip, but a little cold. Our group was made up of a couple of onery rafters from Billings, Montana with some other characters sprinkled in for flavor. Early on in the process of planning for the trip we were informed that the trip was being organized by the QFU ( Queen of the F’n Universe ), which set the tone for the rest of the trip. Upon learning that I was heading on a GC trip the only advice James Bagley gave me was: "Enjoy, but make sure you run Tapeats Creek. Its class IV so it would be fun in a playboat, but I couldn’t convince any other kayakers to go because of the UN-UN." Immediately my heart raced, beads of sweat formed on my forehead, and I started salivating. For you see the "UN-UN" is full of mystery and gossip that make for great campfire or bar stories. Others include the inside of Opal Gorge, Rick’s Slide on the Carbon, and the thirty-footer some Corvallis hair boaters were forced to run blind back in the day on North Boulder. OK, seriously, this one wasn’t that bad, but with no option to hike out it still made us question the wisdom of dropping in to the gorge. But on to life in the Canyon. Tapeats Creek was the second layover of our trip. This was intentional since we were paddling during some of the shortest days of the year and we planned to stop here so we could do the day hike to Thunder River Falls. 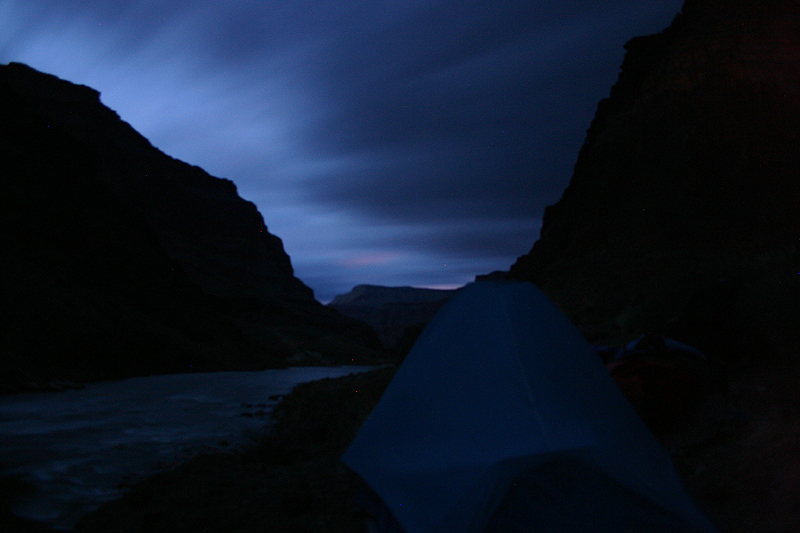 We arrived as planned at the mouth of Tapeats and after setting up camp started the long hike up to Thunder Falls. 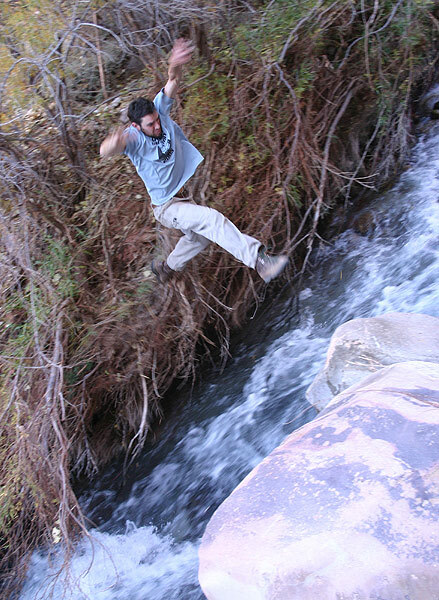 The author jumps across Tapeats Creek during the hike in to Thunder River. When we arrived at Thunder River Falls was at the waterfall we were rewarded with the spectacle of Thunder River plunging out of the cliff face, then a half mile downstream merging with the smaller ( at this water level ) Tapeats Creek. This is the second place I know of where a creek and a river merge and it continues as a creek. The other is where the Roaring River and Crabtree Creek converge at Larwood Park in Oregon. 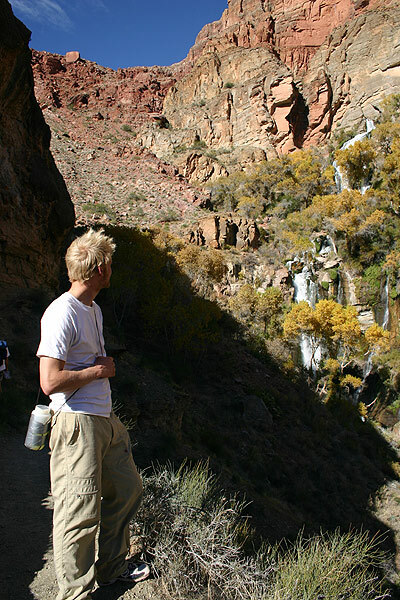 Jon Fowlkes checks out the source of Thunder River, where it emerges from the canyon wall. From the trail on the canyon rim we could see waterfalls in steep rock gorge on Tapeats Creek, and for Jon and I this was enough and we couldn’t say no. Looking down into the Un-Un corner in Tapeats Creek Gorge. With daylight running short Jon and I ran down the hill to our campsite, giddy with excitement. After a quick refuel of gorp, snickers, beer, and cheese we dashed back up the hill with our gear. When I say 'dashed' of course, I mean we grunted our way back up the extremely steep pitch above the camp and then up the relatively flat trail above which runs next to Tapeats Gorge ( I’ve got to make a note here that I much prefer climbing around cliffs with a playboat than a creeker ). 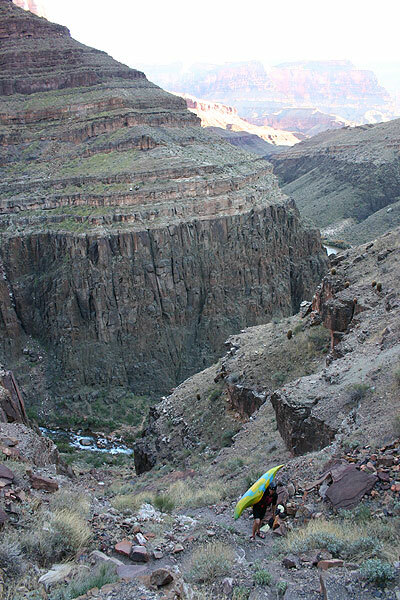 Jon hiking up into the Tapeats side canyon. Tapeats is visible on the bottom-left side of the photo. Since we had scouted it earlier we knew where we would put in, at the five-foot slot waterfall about quarter of a mile upstream of the final gorge section. It would be possible to run more of the creek, but it is low gradient, scrappy, and brush infested upstream of the slot falls. After a quick ro-sham-bo it was decided that I would probe. I had no problems and Jon cleaned it up as well. Mike boofs a folding falls near the top of the run. Jon takes the far right side line of the folding falls near the top of the run. Soon the walls rose around us and we dropped into the gorge proper. Quickly we found ourselves at the first large drop. Like most foolish kayaking endeavors we had only scouted this drop from high above, so we underestimated its size and difficulty. With a crash-boom-bang I fell off the drop, pinned sideways and carped a couple roll attempts. With one shoulder resting on a rock and my head resting on another, I was I was worried Jon would drop in right on me. I shook this off and took a moment to say: "calm down, get a roll, and no swimming!" I got a roll and looked up the drop to see Jon wondering what I was doing. I signaled to boof with a left angle and keep his nose up. His line was slightly better than mine, but nothing you really want too many other people to see. Over head we could hear our fellow rafters cheering us on and I’m sure laughing at us. Two more small drops and we encountered a sieve rock jumble, so we portaged. And then we reached the UN UN. Jon enters the gorged-out section above the UN-UN. I got out on the left and climbed down to scout around the corner. There it was: nothing but a flat pool with a sandy beach and a hiker trail to river level. I smiled and climbed back up. Jon, sitting expectant gave me a "Give me your best shot, whatever it is I’ll run it blind look." Trying not to smile I said in my best concerned voice: "Here is what I see.. Sandy beaches, hot babes, and cold beer." And with that we hopped in our boats and flew around the corner. There was one drop left on the run, a five footer landing in a slot. Jon probed and I swept it up. From there we had a short paddle out to our campsite to our crew who was making dinner. Another beautiful night in the canyon with a wonderful group of people..
Another beautiful night in the Grand Canyon. 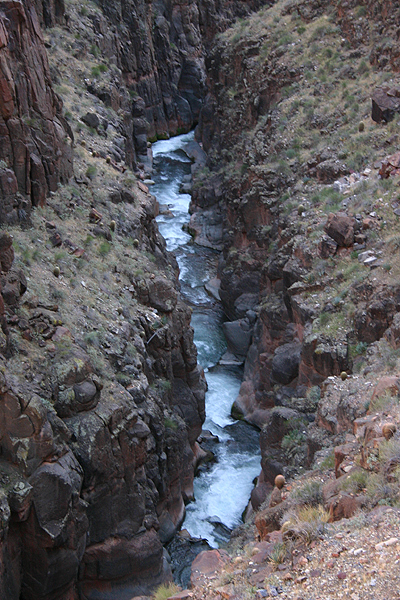 Tapeats Creek is nestled deep within Grand Canyon National Park. There are two ways to access this area: hike in from the North Rim or get a Grand Canyon permit through the lottery system. I wish you luck either way, although I highly recommend the latter. 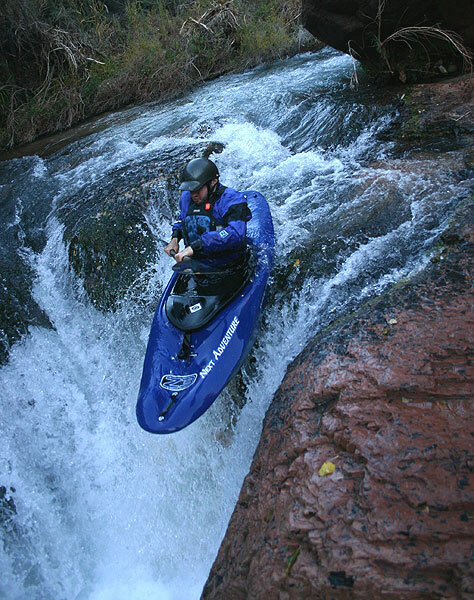 Thunder River is spring fed and has a nearly constant flow year-round, so the flow we paddled is the minimum year round flow. 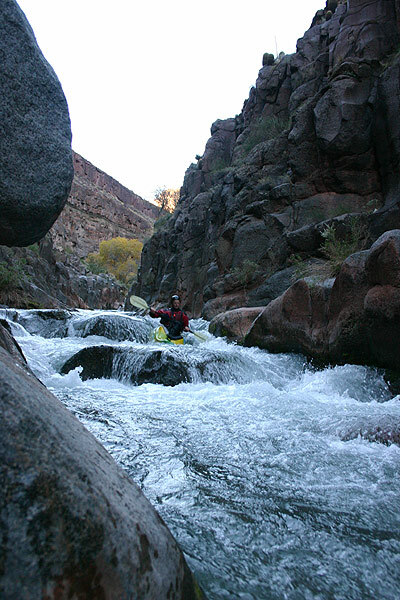 However, all side creeks in the Grand Canyon are prone to flash flooding so kayak this creek this at your own risk in the rainy season.